Inexplicable events on the crypto-market continue to multiply. But they are inexplicable only from the point of view of a peacefully grazing hamster. The advanced community does not even have to guess. Especially if they read regularly Coinstelegram. – … She played as actress, drank a bit with her friend, but that was not a point. Generally she was expecting! And there was no other important thing for her. Yes, in general – crypto-market expects something. How to know – what? On the eve of Valentine’s Day, BTC futures will be closed on the Chicago Board Options Exchange (CBOE). In December, they closed at $ 3,340. This is the explanation why the Corn that grew in January (it was above $ 4,000, then kept around $ 3,700) collapsed again. Why does Ether go down? To take off after hard forks, this is understandable. But the tools for the collapse may be different. For example, verbal interventions – a message from the provider Parity (a quarter of the Nodes of Ether) that a critical vulnerability was found. Parity urges updates ASAP. 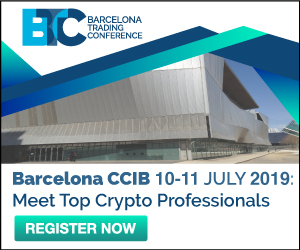 According to the notice, there is a vulnerability involving RPC requests which create a vector for an attacker to knock a Parity node offline, potentially threatening about 25% of the Ethereum network with potential exploits. On the one hand, Parity hurries developers and warns not to shift Constantinople any more. And on the other, it calms down: if vulnerability is found, it means that it is not dangerous. But the market has reacted. Why TRON is growing – this is a simple mystery. The price of Tron on the BitMEX exchange rose by 48% in a few minutes, to 0.00000960 BTC. Then, however, collapsed to 0.00000778 BTC. The average market price rose by 11.9%, to $ 0.0286. Apparently, after hardfork Constantinople hard times for TRON may come. It is known that TRON is suspected of plagiarism of Ether (see https://coinstelegram.ru/2019/02/01/tron-eos/). The fact that it is pumped now is just the right decision for this case. 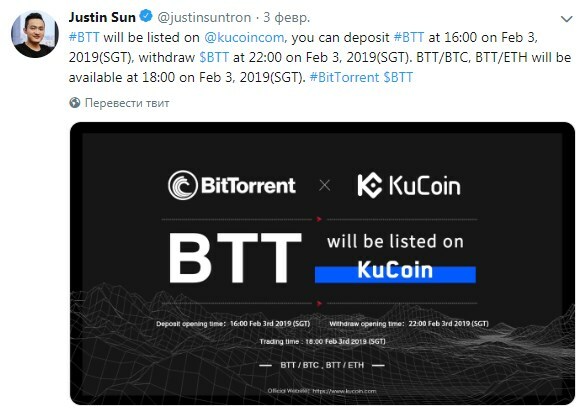 Now Twitter of TRON CEO Justin Sun is bursting with reports of new partnerships and all sorts of bonuses such as the BitTorrent (BTT) token airdrop. In total, 10,890,000,000 BTT will be distributed, 1.1% of the total emissions. Every year until 2025, the volume of airdrop will increase by 0.1%, to 1.7%. In general, everyone prepares as he can. For what? Hardly to Ethereum hard fork. The most logical explanation is that the market expects a coin of Pavel Durov. Initially, the launch of the TON platform and the Gram cryptocurrency was scheduled for autumn 2019. Then – for the middle of the year. But the last leak (from the site “Durov Code” https://kod.ru) reports that this could happen as early as in March. – For any internet (non-physical) based business, I don’t understand why anyone would not accept crypto for payments. It is easier, faster and cheaper to integration than traditional payment gateways. Less paperwork. And reaches more diverse demographic and geography. Holy simplicity! Does not CZ know why? Volatility is the answer. To deal with such a volatile asset as a crypto and not to lose, you need to have major addition to the price. For online retail this is unacceptable. So, we are waiting for The One – Pavel Durov and his altcoin? It is not looks like decentralized. The whole market depends on the will of one person. But for now, it looks like – it is!